Kilohearts has officially announced the upcoming launch of Phase Plant, an endlessly flexible virtual instrument that takes the company’s Snapins eco-system to new heights. Combining the proven power and flexibility of Snapin effects with an array of all-new signal generation and modulation devices, Phase Plant is a state-of-the-art hybrid modular system that gives you unprecedented freedom to construct the synthesis- and/or sample-based instruments of your dreams. Phase Plant’s single-window interface is divided into Generators, Modulators and Effects panes, into which modules are loaded and layered as required. Generator modules include the Analog and Wavetable oscillators, a high-quality sampler and a noise generator, and are accompanied by multimode filter and distortion units. Audio-rate frequency, phase and ring modulation are effortlessly brought into play between Generators, filters and distortion modules, opening up all sorts of extreme sound design possibilities. The built-in Modulators comprise a powerful LFO with customizable waveform, an AHDSR envelope with onset delay, a Random/S+H generator, and various MIDI messages and multipliers. The per-voice and global Effects racks, meanwhile, let you integrate Kilohearts’ colorful Snapins effects modules into Phase Plant’s signal path. Six Snapins are included (Delay, Chorus, 3-Band EQ, Gain, Limiter and Stereo), another five (Compressor, Distortion, Filter, Phaser and Reverb) can be added with the optional kHs Toolbox Starter pack, and over 20 more are available individually or in a range of bundles. You don’t have to own any Snapins beyond the included six to get started with Phase Plant, but the more you have, the more you can do with it. Add to that a massive library of presets and samples, impressively low CPU and resource usage, and Kilohearts’ signature ease of use and stellar sound quality, and you have the first must-have plugin synth of 2019. 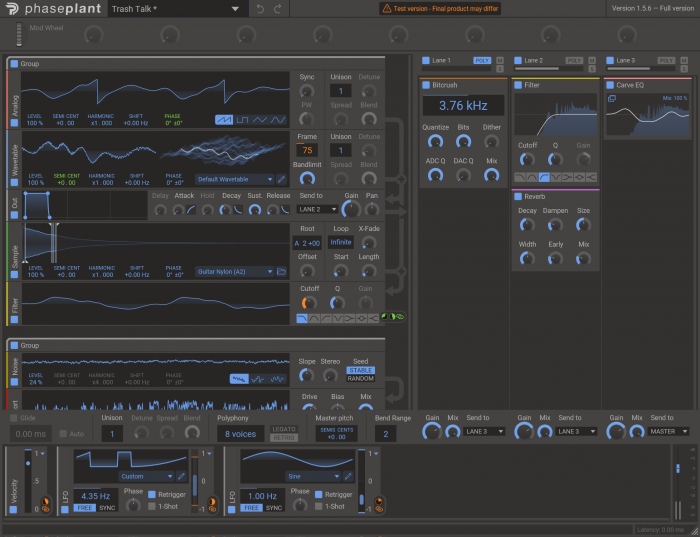 Hybrid synthesis engine with analog simulation, wavetables, sampler, and noise generation. Snapin compatible. Add effects per voice, or to all voices, respectively. Intuitive modulation system with customizable modulation sources. Audio-rate modulation between all generator types: Phase Modulation, Frequency Modulation, Ring Mod, and more. Audio-rate modulation of filters and distortion on generators. Phase Plant is scheduled for release in Spring, priced 199 USD/EUR bundled with kHs Toolbox Starter, or 169 USD/EUR on its own. The synth will be showcased at the 2019 NAMM Show, where Kilohearts will also be giving press interviews and hands-on demonstrations.